toggled LED fixtures are designed to replace less efficient metal halide, fluorescent, and induction fixtures. toggled LED lights are UL listed, FCC compliant, are rated for 50,000 hours, and have a *limited 6-year commercial warranty. In addition, toggled LED fixtures do not use ballasts, reduce facility lighting costs, enhance the quality of light, and are mercury free. Toggled Focused Spectrum Grow Lights are engineered to provide improved growing performance for green leafy plants using selected LED output wavelengths. Peak wavelengths of 455 and 640nm are optimal for light absorption leading to better plant growth. Toggled Full Spectrum Grow Lights also provides light in the wavelengths between the blue and red peaks for a more complete spectrum. Ideal for garden, hydroponic, and greenhouse applications. 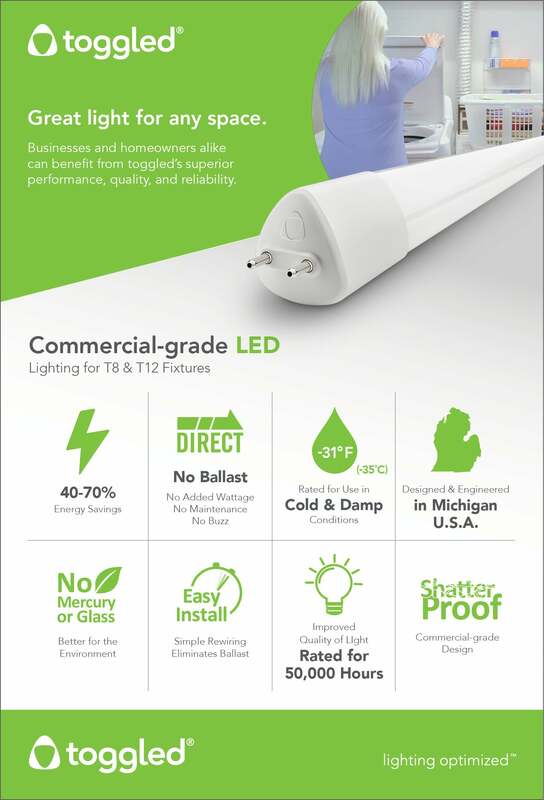 Fixture Dimensions (LxWxH): 48-5/8" x 21-3/4" x 3-7/8"
As with all toggled LED lights, toggled gro lights are mercury-free and energy efficient, and designed to work in standard T8 and T12 fluorescent tube fixtures. Following a simple retrofit process to bypass the ballast system, toggled grow lights run directly off of building line power eliminating ballast system failures and replacement costs.